Driving an environmentally responsible vehicle does not equate to driving a powerless pedal car. In fact, the 2017 Hyundai Sonata Hybrid is more powerful than you might think. To start with, the 2017 Sonata Hybrid is powered by a 2.0-litre GDI Atkinson cycle engine that makes up half of the Blue Drive® powertrain. It is quite capable of delivering 193 horsepower. Hyundai has spent a lot of time, money and research to develop the Blue Drive® Hybrid System, which consists of the GDI motor, as well as an electric motor. The system seamlessly switches between the two power sources as you travel. The gas engine gets you started by giving the lithium-ion polymer battery its initial charge. From there, the electric motor keeps you running. Even the brakes help to keep you powered by taking kinetic energy and making electricity out of it. Hyundai paired its power sources with a six-speed Shiftronic® transmission that is designed to feel more natural than a CVT. That means you don’t feel the changes as you accelerate through the gears. It even has a push button start for a futuristic feel. 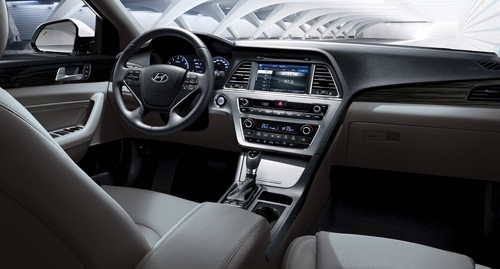 Keeping with technological advances, Hyundai offers the driver an array of information on the 4.2-inch LCD instrument cluster on the dash of the Sonata Hybrid. In addition to the standard display of speed averages, fuel use and projected remaining miles, this Sonata can tell you the hybrid energy flow and safety feature updates from your installed safety systems. The 5.0-inch touch screen is mounted in the centre of the dash and includes a rearview camera, as well as other pertinent information and entertainment connections. When equipped with the Hyundai Blue Link™, your digital life comes along with you for the ride. When you connect the Blue Link™ Connected Car app to your smartphone, you can do things like remote start your car and set the interior temperature without leaving your home. As your car warms up, you can finish your morning coffee. It’s the perfect start to a winter morning. Other comfort features in the cabin include a heated leather-wrapped steering wheel and heated front seats with an 8-way power driver’s seat that will help you find the perfect seating arrangement for comfortable driving. The 2017 Hyundai Sonata Hybrid comes in a couple of trim levels, and with each level comes more high-tech features that include advanced safety systems. The base model offers Blind Spot Detection with Rear Cross Traffic Alert, as well as Lane Change Assist. From there, the safety features only become more sophisticated. Adaptive Cruise Control monitors the road in front of you and makes speed adjustments if you come upon slower traffic while in cruise mode. Forward Collision Warning works the same way in an effort to avoid a front-end collision. In addition to the Hybrid, Hyundai offers the Sonata in a plug-in model. The PHEV comes equipped with top-of-the-line features like a 9-speaker Infinity® audio system and a Driver’s Integrated Memory System that remembers your favourite seat and side mirror positions. The PHEV is equipped with a plug-in charging port and a charging cable. 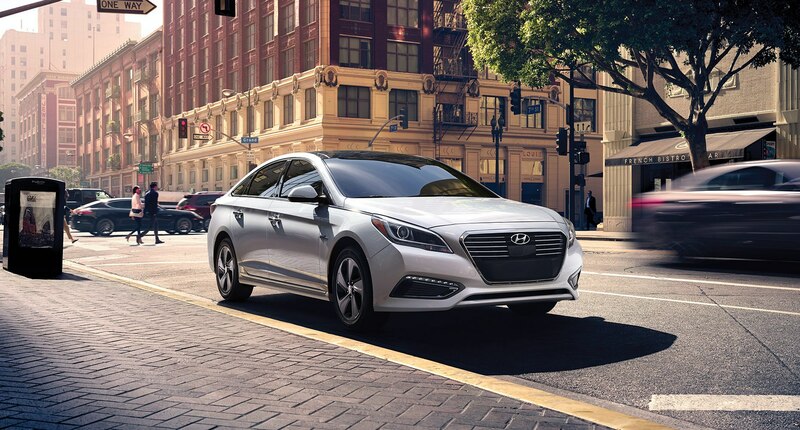 Regardless of which of the 2017 Hyundai Sonata models you prefer, you will see why Kelley Blue Book keeps giving Hyundai awards for this sedan the minute you test drive it. Come by and see us today.